One of the biggest pains in the garden this year, besides fire ants and weeds, has been the Serrano plant. It’s a hold over from last year’s garden and the only reason it got a reprieve was because I got it mixed up with the jalapeno plant. Serrano peppers are hot. Really hot. Too hot to eat as casually as we eat jalapenos and they’re not really meaty enough to candy. So what do you do when you’ve got over 100 peppers, screaming to be picked? 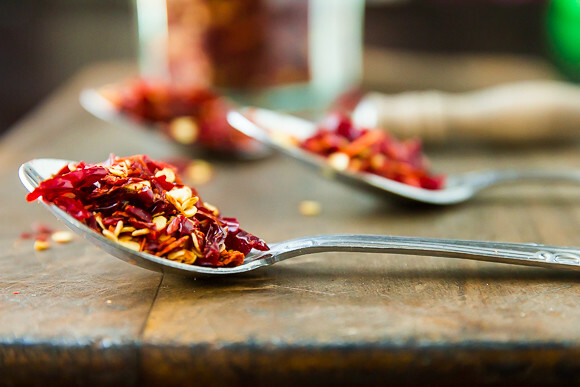 Crushed red pepper is one of those things that, once you make at home, you’ll never want to buy again. And it takes no real special equipment although some modern conveniences will make the crushing go faster. And with less eyeball-stinging and therefore probably much less cursing. 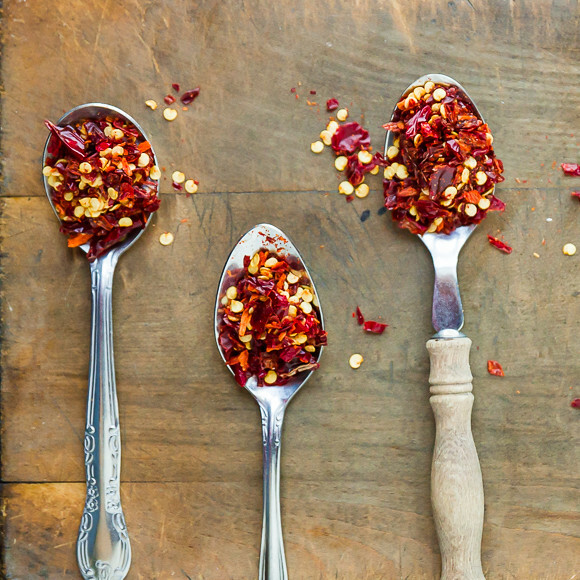 Your jar of homemade red pepper flakes will be a vibrant shade of red, hinting at the life in each bite. But even more than the heat, which of course I loved, was the texture – crisp and crunchy. A coarser grind (done by hand, blender, or food processor) will give you a crispy, crunchy bite when sprinkled on top of a bowl of honey sesame chicken and couscous. A finer grind (done with a spice grinder or a lengthy spin with the blender) will give you a powerful powder for seasoning a mean (AND I MEAN REALLY MEAN) pot of chile. There’s no real recipe here – after all, there’s only 1 ingredient: Fresh red peppers (I used serrano). I don’t have a food dehydrator so I simply used the “Keep Warm” setting on the oven – it’s 170 degrees. One day, I’m going to try Alton Brown’s DIY dehydrator method (2 AC filters, a bungie cord, and a box fan) but for now, the oven is about as unmessy as it gets. We cut the stems off the peppers and cut them in half down the length of the pepper. I put them on on an ungreased baking sheet in the oven at 170F (the “keep warm” setting) for 6 hours and then I shut the oven off and let them sit overnight. By morning, they were perfectly crispy and will crumble when squeezed. And shatter into a million pieces when dropped on the floor and stepped on. Peppers can be crumbled by hand – but only if you have gloves; crushed in a plastic bag, run through a food processor or blender, or coarsely ground and then transferred to a spice grinder. 71 peppers yielded over 1 cup of coarse red pepper flakes. And I’m a little disturbed at how fast we’re tearing through it. I want to do this so badly!!! Wow – I’ve always wanted to try this! This is something I have never even thought to do on my own. What a great post! Never thought about doing this at home, thanks for the idea! Love that first photo, too. Gorgeous! I am positive making your own crushed red pepper will result in a fresher and more vibrant product! This a such a great end of summer project, a very enjoyable post! And with spectacular photos! Such an inventive way to use your serranos! Whenever I get around to having a garden of my own, I completely want to do this! Hi there. Anyone can have a garden, it is only the size that differs. You can use a box the size of an egg tray. Divide it into 4 sections and plant only 2 or 3 seeds in each section. Maybe some chillies, beans, tomatoes and a lettuce. As the vegetables are nearly all use up, start by planting another seed in each section and so rotate. You will have veggies the whole year through. A door step or a balcony will suffice to put your garden box on. Try it and enjoy! Sounds like having a persistent serrano plant was quite fortuitous! You made an awesome use of those super hot peppers! I did this a few years ago (basically the same way you did it) and I have vivid memories of how “hot” my house smelled and felt. My nose was on fire, it was strange! I had to run around and open all the windows in the house! Poor air circulation in my kitchen maybe… Still, it was totally worth it! I just used up the last of that batch a few months ago! DOING THIS! I have so many peppers and not sure what to do with them! That’s a lot of serranos! I can feel the burn on the back of my tongue. What a great way to use them though, you’ll be able to carry yourself into next summer with your pepper flakes. And (just saying 😛 ): If I had serrano peppers in my house, I’d be making jerk chicken too! I have Thai and Bird hot peppers that I spread on newspaper and let air dry. I save seed and grind some to sprinkle in my flower and vegetable gardens to deter animals digging. This is great. My husband and I also do jalapenos , habaneros,and green yellow and orange bell peppers. If you want to make quick work of this job we found that using our new wave oven on heat setting of 1 works great. I love this article! I am very thankful to live in Costa Rica, where during the dry season my back porch is a food dehydrator. A constant breeze and a UV index of 10-12 gets the job done very quickly and very well. And I love blended crushed red pepper! I am currently drying a mix of sweet chilies, jalapeños and “panamanian” chilies that I am looking forward to blending up into a mixture of freshly dried and aged peppers. Pura Vida! 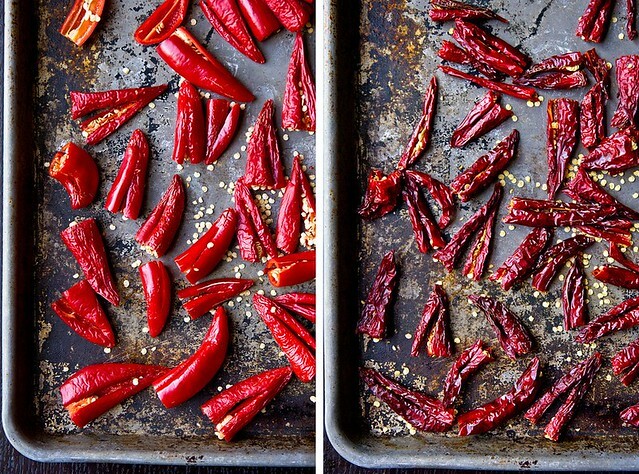 You have just given me a great idea of how to dehydrate my chilies and Peppadews that grow in my garden. I have a ‘Sun Stove’ which is a box with a lid made of perspects. I have made roast chicken and potatoes in it before NOW, I will use it to dry out other things as it gets very hot here in sunny South Africa. Thank you for this great blog and ideas. She is 110% correct; once you try this you will scoff at store-bought crushed red pepper. I bought a slice of pizza at a college football game tonight, and the little packet of crushed pepper I was forced to use from the condiments bar tasted like sawdust compared to my homegrown stuff. My personal preference is crushed cayenne with a few habaneros mixed in, but trust me, you really can’t go wrong. You absolutely DO NOT need to have the time/space for a garden to partake in this. From my experience, spicy pepper plants fair extremely well in pots on a semi-shaded porch. (Just make sure to use a big enough pot). You can get everything you need at any major hardware store or farmers market. I’ve done this with Jalapenos that had ripened to red, Serranos that were still green, and Serranos that had ripened to red. 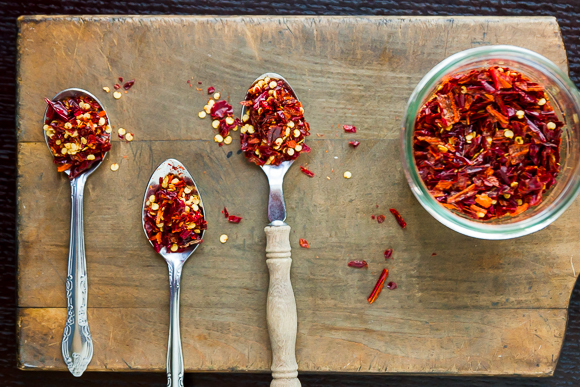 All are much more potent than the generic flakes; the serranos are fiery hot! This week I did a batch with green Thai peppers — the kind that are skinny and about 2″ long. The result of that is perhaps even hotter. I might try your low-temp oven method next time. Until now, I’ve sliced them length-wise with a knife, scraped out most of the seeds, saving them of course, and simply letting them air dry on the counter until fairly crisp. One of the rewards is that the result preserves the vibrant flavor of the individual type of pepper. You simply cannot buy such a spice in a store, to my knowledge. My quantity each time was small — 4 or 5 peppers — and in that case you can manually mince them to get just the size of flake you deem appropriate, and avoid having part of the batch end up as powder. My suggestion: the hotter the pepper, the smaller the flake.